By the same author as The Black Swan. How to deal with - and exploit - the inherent uncertainty of life. Ryan recommended this earlier, and I had already read Black Swan, so followed up here. I’m of two minds with this book so far. On the one hand, I think Nassim does a great job at taking swings at The Establishment thinking in economics in particular, but on the other hand the tone at times seem needlessly polemic. The irony of me saying that of all people is not lost. Which is perhaps the best take-away from the book so far: That it’s a mirror on how to present arguments in a compelling, believable, punchy fashion, without getting lost swinging at ghosts and straw men. There are so many foundational ideas and mental models in that book. I've never come across someone who read the whole book and argues that he's not right about a lot of things. Antifragile by NN Taleb - will show you a lot of examples of how to make investments (not just financial ones) in life, so that you always end up with a positive outcome. "The Black Swan" by Nassim Nicholas Taleb (and basically the others in the series like "Fooled by Randomness" and "Antifragile") are also my favourites. It explained things that I sort of felt existed but unable to articulate. These books explained it well, about the role of chance/probability and randomness, in our lives. The five-book series, "Incerto", by Nassim Nicholas Taleb has had a profound impact on how I think about the world. There’s some overlap across the books — but you'll likely find the repetition helpful in retaining the content better. Antifragile is a standalone book in Nassim Nicholas Taleb’s landmark Incerto series, an investigation of opacity, luck, uncertainty, probability, human error, risk, and decision-making in a world we don’t understand. The other books in the series are Fooled by Randomness, The Black Swan, and The Bed of Procrustes. Nassim Nicholas Taleb, the bestselling author of The Black Swan and one of the foremost thinkers of our time, reveals how to thrive in an uncertain world. Just as human bones get stronger when subjected to stress and tension, and rumors or riots intensify when someone tries to repress them, many things in life benefit from stress, disorder, volatility, and turmoil. What Taleb has identified and calls “antifragile” is that category of things that not only gain from chaos but need it in order to survive and flourish. In The Black Swan, Taleb showed us that highly improbable and unpredictable events underlie almost everything about our world. 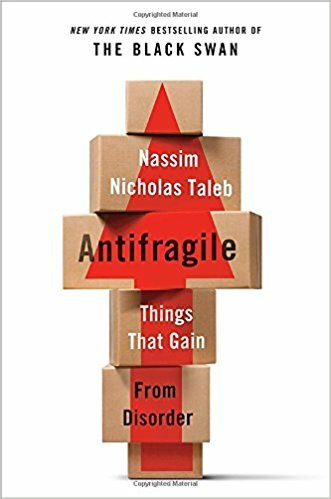 In Antifragile, Taleb stands uncertainty on its head, making it desirable, even necessary, and proposes that things be built in an antifragile manner. The antifragile is beyond the resilient or robust. The resilient resists shocks and stays the same; the antifragile gets better and better. Furthermore, the antifragile is immune to prediction errors and protected from adverse events. Why is the city-state better than the nation-state, why is debt bad for you, and why is what we call “efficient” not efficient at all? Why do government responses and social policies protect the strong and hurt the weak? Why should you write your resignation letter before even starting on the job? How did the sinking of the Titanic save lives? The book spans innovation by trial and error, life decisions, politics, urban planning, war, personal finance, economic systems, and medicine. And throughout, in addition to the street wisdom of Fat Tony of Brooklyn, the voices and recipes of ancient wisdom, from Roman, Greek, Semitic, and medieval sources, are loud and clear. Antifragile is a blueprint for living in a Black Swan world. Erudite, witty, and iconoclastic, Taleb’s message is revolutionary: The antifragile, and only the antifragile, will make it.